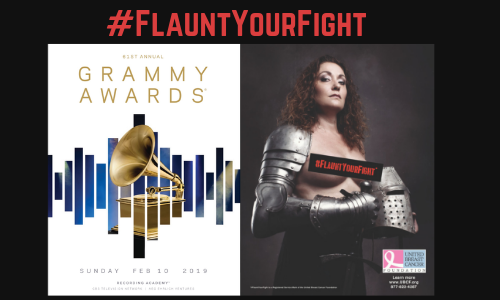 United Breast Cancer Foundation (UBCF) is pleased to announce the publication of their new print Public Service Announcement (PSA), #FlauntYourFight, in the 61st Annual Grammy® Awards Program. The Grammy® Awards, “Music’s Biggest Night,” returns to Los Angeles at the Staples Center airing live on CBS this Sunday, February 10 at 8 PM ET. 15-time Grammy winner Alicia Keys will be hosting with performances from a variety of musicians, including Janelle Monáe, Lady Gaga and Mark Ronson, St. Vincent, Kacey Musgraves, H.E.R., Shawn Mendes, Camila Cabello, Cardi B, Brandi Carlile, Dan + Shay, Post Malone, Dua Lipa, Chloe x Halle, Travis Scott, and more. Additionally, Diana Ross will give a “very special performance” in honor of her 75th birthday. Additionally, Yolanda Adams, Fantasia, and Andra Day will perform a tribute to soul legend Aretha Franklin, who passed away in August 2018. The #FlauntYourFight print PSA, found on page 61 opposite Best New Artist Margo Price, features a compelling image of a Breast Cancer Survivor dressed in Viking armor, sending a powerful message that she is armed for battle and will conquer whatever comes her way. UBCF is committed to serving women and men impacted by the disease through seven life-supporting programs, including early detection services through the Breast Screening Program. Share your personal breast cancer experience through UBCF’s #FlauntYourFight campaign. The 61st Grammy® Awards Program, music’s biggest collectible, is available in both print and digital versions and is available for purchase at over 30,000 retail outlets nationwide, including Target®. The Program is available at all official Grammy® events, distributed to all attendees, is on the Grammy® website, at the Grammy® Museum, and in the Recording Academy’s major chapter markets such as Atlanta, Chicago, Los Angeles, Memphis, Miami, Nashville, New York, Philadelphia, San Francisco, Seattle, Austin, and Washington, D.C.. Estimated total distribution is 1,238,995.